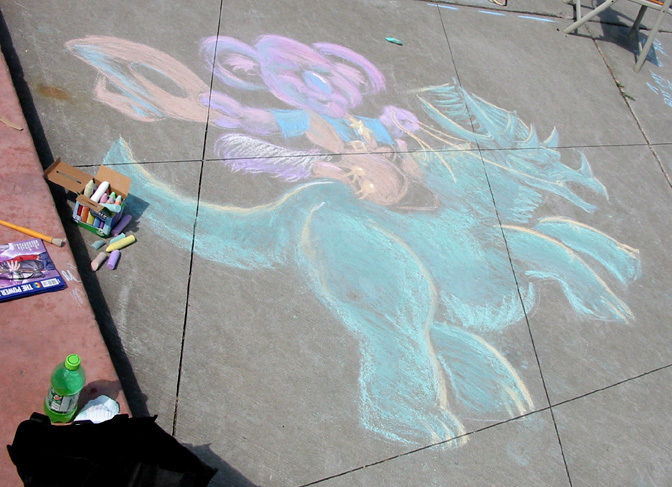 I decided I'd post the progress pics I took while doing the chalk design at the big TAM event yesterday. It was great fun and very tiring at the time--but BOY, am I sore today!! I do most of my art sitting at a computer desk or a drawing table, so I was workin' muscle I had forgotten I even HAD! Anyway, so Step one: The basic under drawing...really just a VERY loose sketch. Step two, the most time consuming part (especially since I overambitiously made the thing so big) was filling in the color. I tried to give it a bit of dimension, although the limited palette of not very intense pastel colors I had available made that difficult. 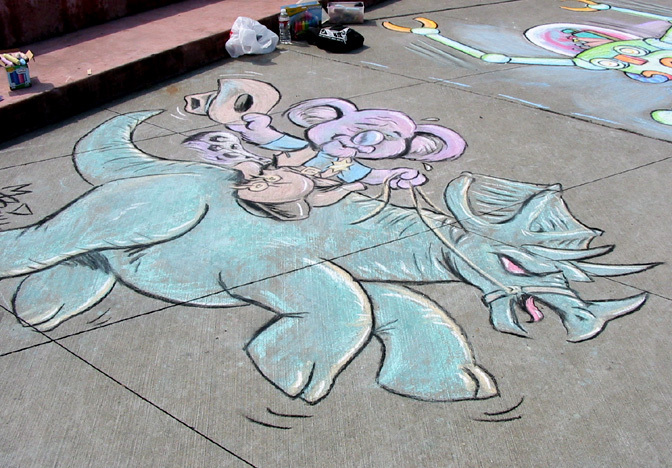 I went through a LOT of chalk trying to fill that tryke in too! Step three was the key to the whole business, and it was thanks to Mark Monlux that I was able to do it! A black outline done with charcoal briquettes! Mark brought a whole bag of them and let me use some. Since the colors I had were very soft, the outline really made them pop--and I admit, I relied heavily on the outline to make this image work. In future, not only will I work smaller, but I will also try and secure some more intense colors than I had, plus some actual dark colors. I'll also try and bring my own charcoal too! Also, although I had the forethought to borrow knee-pads (thanks Edmund! 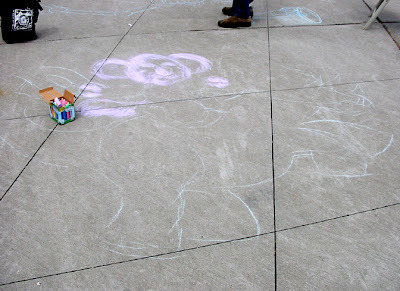 ), I didn't know that rubbing the chalk in a bit to secure the lines was needed. So I literally wore through the skin of a couple of my fingers! Gloves will be another neccesary item to add to the arsenol! And finally, step four--signing the finished product of a few hours of pretty rough work! 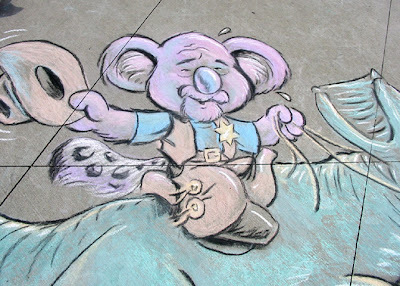 Rough for a chubby old koala like ME, anyway! Again, the theme was "Identity". 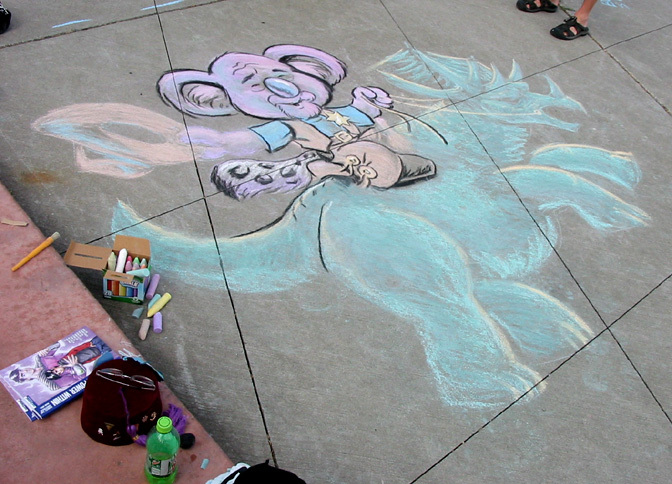 I chose to take advantage of my so called FURSONA that I developed for furry-orientated stuff. He doesn't get out much, so it was good to have an excuse to trot him out. I don't role play or anything and I don't have a fursuit. This is just how I picture myself in "furry" parlens...a chubby little koala bear with a big fluffy snow leopard tail, representing my delusions of granduer. Dressed as a sheriff and riding a dino to represent some of my other interests. All that's missing is a flying saucer shooting at him from above! Maybe next time!